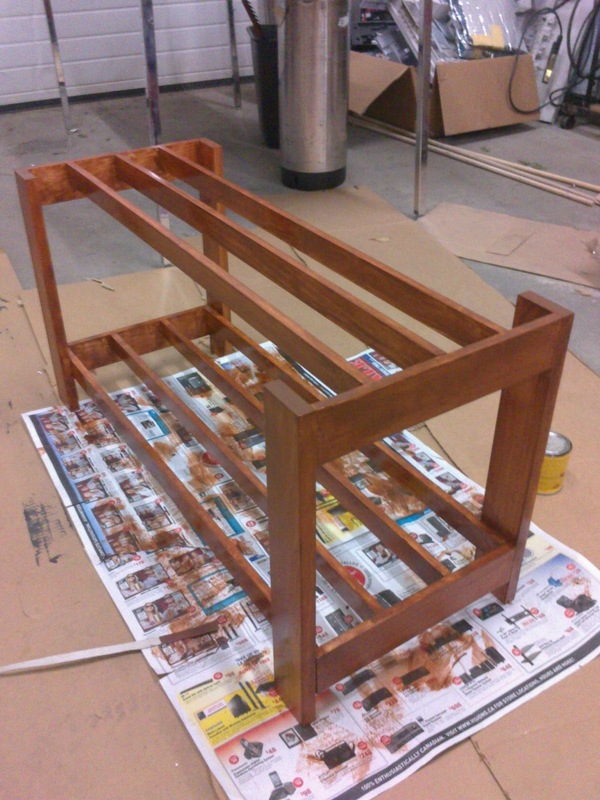 I finally made time to stain the shoe rack that I've been building over the last month. It took about an hour and a half to stain. It turns out that staining is really hard to do well. I used a gel stain - 'Cherry Wood'. The manufacturer recommended applying liberally, however I found this just encouraged dripping and unsightly corners and edges. I used a brush to gradually apply the stain, re-brushing after a couple of minutes to even out the stain. I spent a lot of time sanding to 220 grit before I started, but I think I could probably have gone a little further. I also could have been a little more even with the sanding - I'm pretty sure that is the cause of most of the blotches left after staining. I knew staining would show up my mistakes, I just didn't realise how many mistakes I'd made! Fortunately most of the mistakes are in hard to see places and the end result, observed from the proper distance is pretty acceptable. I will write another post once it is dry and set up in its new home in the closet! On to the next project - jointing and planing my own lumber from rough lumber.